Juliette Binoche is a magic actress. She has made her name playing a series of melancholy women but now the French woman is enjoying the sweet taste of success with a lighter role in the love story "Chocolat". Nominated for five Academy Awards including Best Picture, Best Actress, and Best Supporting Actress, "Chocolat" is a wonderfully sweet film with an outstanding cast. 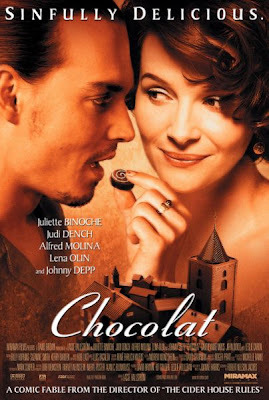 "Chocolat's" an amusing romantic comedy/drama, filled with love, life, and, of course, chocolate. "Chocolat" is a beautiful story, told with love and acted with passion. While it may not have been the most commercially successful release of 2000, it was definitely one of the best. If you haven't seen it, it's a fairytale story about an extraordinary chocolate shop that opens in an ordinary town and soon turns the prosaic village upside down. Even if you have seen it, watch it again and see how it inspires you. Your dish doesn't even have to include chocolate, maybe the movie will inspire you to make some Mayan, Gypsy, or French fare.